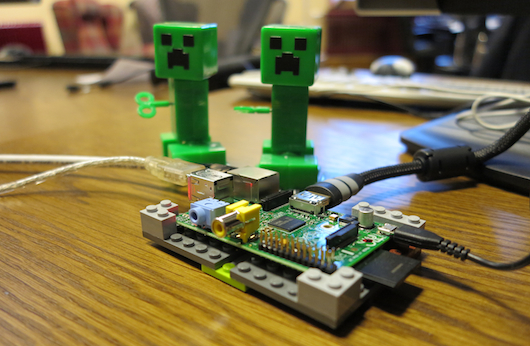 The folks over at the Raspberry Pi Foundation often gets asked “does it run Minecraft?” Mojang, the team behind the block building game, has announced that they will be releasing Minecraft: Pi Edition. This port will be based off the Pocket Edition of the game, but with a revised set of features. So what does this have to do with hacking? Mojang has announced that the Pi Edition will have “support for multiple programming languages.” There aren’t too many details about what this support will entail, but it looks to be aimed at teaching programming by using the world of Minecraft. Hopefully, it will be possible to interface with the RPi’s expansion header to allow external devices to get data and create objects in the Minecraft world. There’s a lot of potential for hacking and learning programming skills. The best part? It will be a completely free download. We’re looking forward to the launch. Maybe they should ask themselves “but does it run LELO Lyla?” since that’s the hit these days… so I’ve heard. What is so interesting in a game with worst resolution than 8 bit games written in Java? That said: Minecraft can be look stunning with the right texture pack. Because the reasons for playing Minecraft are varied, it makes it extremely difficult to be critical about the game without being crucified by rabid fanboys. The glow of political correctness that surrounds the popular discussion of this game should and does offend many. That said, I think the tedious gameplay and voyeuristic nature of it’s YouTube fandom brings comfort to the casual gamers who play this. The application of it as a teaching tool seems forced, but it’s also the obvious route for those who want to fit in with the poser-geek crowd and have the habit of needing to get hands on with abstract concepts. I play it for the snarky intro messages and the absolute worst customer service in the business. That whole team needs to be taken down a peg or five. Some of the most smug *ahem* people you’ll ever see for releasing a made-over lego pack. Some of the stuff I found to be fun, but I really can’t stand the attitude(s) of the creators so I dropped it after a while. The mobile version of Minecraft is written in C++. There’s some Python code visible in the second screenshot. Yay for Python! What about an open source alternative to minecraft, like minetest? I’d suspect it’d be easier to port something more optimized. Also, couldn’t a pi run normal minecraft if you were to connect two together for parallel processing? It has been used to play a minecraft server before, and with the right modifications, could at least launch on a pi the way it is. I will be sure to stay one step ahead with my AVRcraft. I had seen that they were working on this, but I had no idea it would be free. I though they would try to sell it separate like the xbox and pocket versions. Don’t give them any ideas, they already double/triple dip for it. Sounds like this’ll be the first paid-for item on the Pi. Much like the iOS version, i for one am amazed at all the interest in Mine-pi, wont touch it. Everyone I know who played MC, incl myself got bored of it 2 years ago when they concentrated on developing the faggy cotton colour dyeing. Couldnt imagine a less interesting thing for them to do! Read the description (or gods forbid, the source article): It’s FREE!!! If your only gripe about Minecraft on Pi is the cost, you’re a raving idiot. I think it’s pretty stand-up of the Mojang team to put this out there for free. It’s bad enough we have to pay for codecs to use the Pi for more than a headless server as it is. I’m a bit disappointed that most of the comments here are negative. I paid 10 euros for MC a year or two ago, and I’ve spent far more hours playing it than any other game. Sure, people are allowed not to like it, but complaining that other people enjoy it seems a bit daft. Personally, I’m looking forward to being able to hack with it more easily. I’m surprised that Hackaday was the first place I’ve seen this kind of behavior towards Minecraft. There are valid reasons to like/dislike that game and others, but but many of these claims and arguing with someone for liking it is pretty crap.